The CART: Community Densification – Intended Basement Suite Legalization, Expensive, Intrusive Condos, Overbuilt Lots, Subdivisions and a Residential Infill Strategy. The Horse: Urban Forest Strategy Implementation, Housing Strategy, Growth Control Strategies, District Financial Stability, Asset Management Plan, Adequate Infrastructure Funding, Transportation and Traffic Plan with a Funding Source, Official Community Plan Resident Protections and clear Policies, Procedures and Guidelines. 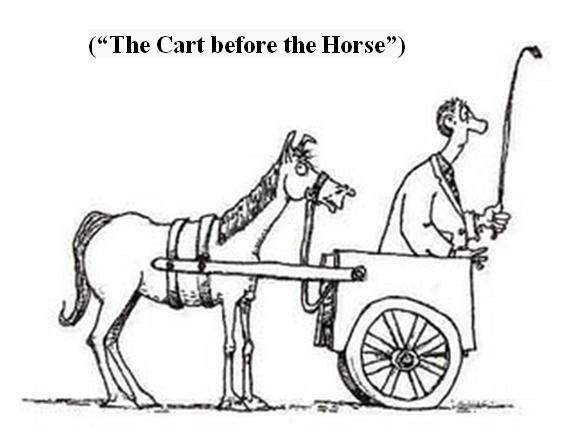 Standard planning practice dictates the “Horse’’ must come first and there have been many attempts by Councillors Murdoch, Braithwaite and Zhelka to introduce an overall Housing Strategy. However, the Mayor has delayed this by continually voting, with his supporting Councillors, to prevent what should have been an automatic first step. Esther Paterson, a concerned resident who will be running for Council in September, attends all Council Meetings. She has highlighted the District’s (now admitted) excessive infrastructure financing shortfall and promoted identification of our Reserve Funds. Her efforts have provided at least a level of transparency about the District’s current disturbing financial position. By doing things in the wrong order, without effective planning and anticipation of the impacts on the Community, existing residents’ interests cannot possibly have been considered nor satisfied. “Denser and Bigger” usually does not mean “Better”. Many communities have learned that densify first, deal with the impacts second, is asking for trouble. It just makes sense to have effective plans and resources in place to accommodate the Mayor’s vision and the amount of growth he obviously wants to see in Oak Bay. At present the Community’s character and desirability are at risk. You wouldn’t build a house without adequate funding and a blueprint – would you? Please help us raise public awareness and elect a balanced, competent Council. As stated above there are now only 5 months until the next municipal election. It must be obvious by now if we stay on our present course, Oak Bay as we know it will be a thing of the past. Oak Bay Watch will continue to keep you updated and provide newsletters and Council reports on important issues. We plan to hold an all-candidates meeting in September. We will also be reporting on the current Community issues that need to be planned for and addressed. It is important that we elect a competent, independent Council, free from block voting, that will address these issues and set priorities that will ensure Oak Bay remains the model community it is today. One way you can help us do this is to help us promote our website. Although we are now averaging 1400 hits per week and have a wide subscriber base, the more residents who are informed and are concerned and aware enough to come out and vote - the better the chance we will once again have a balanced Council who will carefully plan change that respects the qualities of the Community. If you found our last two Newsletters May 5 and May 25, 2018 informative, positive and helpful please provide your friends and associates with our website address oakbaywatch.com. We only print verifiable information and will provide it or explain to them where it is located. Also, let them know we will be providing information in future newsletters that they will not want to miss.